I don't know about you guys, but I love when restaurants have "Make Your Own" menu items. Usually it's for things like pizza and burgers, but I would love that option for pancakes! 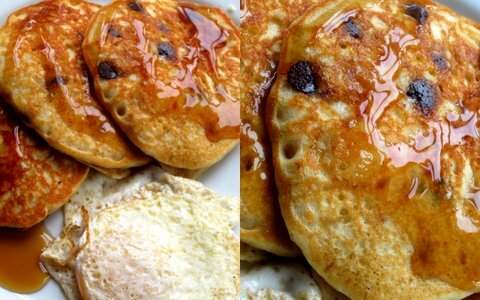 This past weekend I scoured my pantry for inspiration and made a delicious Make Your Own Pancake recipe with dark chocolate chips, ripe banana and peanut butter. Here's the recipe! Mix pancake mix and water. Add the rest of the ingredients. Mix and ladle onto a hot griddle. Once bubbles form, flip and serve warm with syrup. I hadn’t until last night and I am happy to report that it was fabulous! I have to admit that I never even knew what cous cous was until my friend, Hagen, introduced me to it in college. Since then I have experimented with it regularly by adding lots of different flavors and veggies for variation, however tonight was my first try with the little pearls. Found in the ethnic food section of grocery stores, pearl cous cous is a bit bigger than traditional cous cous, has more of a dominant texture and is still great for adding veggies and flavors. It takes a little bit longer to prepare, 10 minutes versus my regular 5 minute cous cous, but it was worth it. The texture has a bit of an orzo/risotto feel and doesn’t clump together like traditional cous cous. I used chicken broth as the cooking liquid instead of water (I always do this in my rice/cous cous) for added flavor. After simmering for 10 minutes, the little pearl granules were ready for the mix-ins. Last night it was sautéed mushrooms and onions which tasted delicious mixed together. Simply by adding meat you could eat it as a main course, a side selection, as a base for stir fry, or even added to a soup or stew for more texture. Since we have our own “Mike” the name still worked – score! We started at our friends, Jenny and Jeremy’s house around 11 am, which is located just a few minutes from downtown Orlando. They had purchased new cruisers that morning and couldn’t wait to hit the road! Since their house is close in proximity to everything, we had tons of exciting options. Without a real plan or route we just decided to ride the neighborhoods for a bit until we were ready for lunch. However, riding on the brick roads made us aware that one of Jenny’s bolts was loose (you could hear her bike coming from a mile away) so we made our first stop at Ace Hardware to fix the problem. The boys had it fixed in no time and we were on the road again. From Ace, we headed into downtown to see what was going on. At this point the skies were still blue and we weren’t worried about the weather…yet. With Tropical Storm Beryl on our heels we knew there was a chance we would be riding in the rain. With plastic Ziploc bags for our phones and cameras we were ready for whatever the skies handed us. Upon making it to downtown, we were starving. Our next stop was Thornton Park for lunch. There are tons of cute shops and eateries in this area that is just off of Lake Eola. Our pick? Graffiti Junktion. They have delicious burgers and a laid back atmosphere. Perfect. As we refueled we discussed the next stop. Jenny mentioned that we should all take a turn picking a destination and see where we end up. After finishing lunch and riding around Lake Eola (we thought there was a festival, but it was just the usual Sunday Farmer’s Market) we headed to Jenny’s pick of the day: The Hideaway Bar. None of us had ever been (even though it is about 2 minutes from Mike’s old house) so we made a break for it…fast. The clouds were getting darker by the minute and in checking out the radar our goal was to get to The Hideaway and let the rains pass. With a little help on the uphill climb, we made it! Taking a joint picture while riding is quite difficult! The Hideaway Bar is a local Miami Dolphins Bar that is located just off of Orange Ave. on a side street near Lake Ivanhoe. It again had a laid back vibe, outdoor seating and very cool artwork on the side of the building. The rains did end up coming and going and then we were off to our next stop. On the way, Jenny was trying to set up a rendezvous point with our other friends who are bike owners, but they couldn’t catch up with us until later. Big Daddy’s in the Audubon Park area was next. This bar, which was a favorite for Rollins kids (my alma mater), offers karaoke everyday at 9 pm. It had a fun vibe, but was empty when we got there (it was 4pm on a Sunday, so that makes sense). From Big Daddy’s we made our way to the Milk District (across the street from the TG Lee plant). Sportstown was next and was so cool. They had every game imaginable and the servers were so nice. We set up shop next to the ping pong table and had the ultimate tournament of champions (not really, but we did have fun playing quite a few games). An afternoon snack of Cajun boiled peanuts and chili cheese tater tots – thank goodness we were biking after all this! While in Sportstown another band of rain came and as soon as it was over we made a break for it. With our friend Lynn and Tuller in tow we biked the final stretch of our escapade and headed back to Thornton Park for dinner. For dinner? Pizza! Anthony’s is a favorite spot in Orlando and had delicious food. We opted for a make-your-own-pizza with mushrooms, pepperoni, garlic, green peppers, onions and feta with a small Greek salad to share. It definitely hit the spot! The last stop on our tour was right down the street at Burton’s Bar. Banana Bread Beer (interesting) and a game of darts was all we could handle before the bike ride home. If you have never been on a bike tour or made up your own – put it on your list. It is such a fun way to see your own city, or any city for that matter and is a great form of exercise at the same time. We had an absolute blast and are already thinking of the stops on our next one! I hope you’re all having a wonderful *long* weekend! So far, so good for us. We spent yesterday playing, relaxing and laughing at the beach with a few of our favorite people. Now off for a do-it-yourself bike tour...let’s just hope the rain holds out!